Valves are lanceolate with short, rostrate apices. Raphe branches are filiform. Proximal raphe ends are straight or deflected slightly to one side. Distal raphe fissures are hooked to the secondary side. The axial area is very narrow. The central area is small and lanceolate and bordered by irregularly shortened striae, often alternating long and short. Striae are radiate and become strongly convergent near the apices. Areolae number 32–36 in 10 μm and are barely visible in LM. Navicula schweigeri has been found in 18 lakes and streams in western Montana and southern Alberta, where it is present in low numbers. This taxon prefers waters with neutral to somewhat alkaline pH (range = 7.1-8.7) and low to moderate levels of electrolytes (range = 90-201 μS/cm). 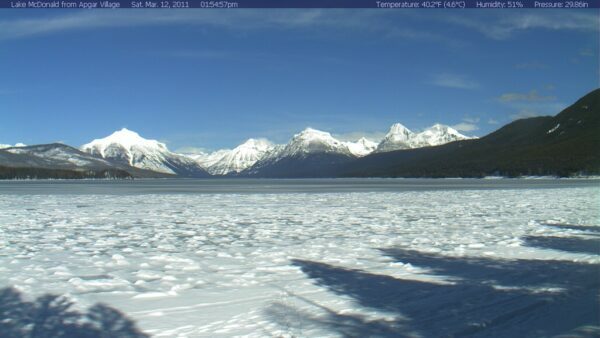 Credit: National Park Service webcam photo. Lake McDonald in winter, Glacier National Park, Montana. Lake McDonald is home to Navicula schweigeri. Valves lanceolate with short protracted and obtusely rounded ends, 39 – 49 μm long, 7.5 – 8.6 μm wide. Raphe filiform, proximal endings straight or deflected slightly to one side, distal raphe fissures hooked to the secondary side. Axial area very narrow. Central area small and lanceolate, bordered by irregularly shortened striae. 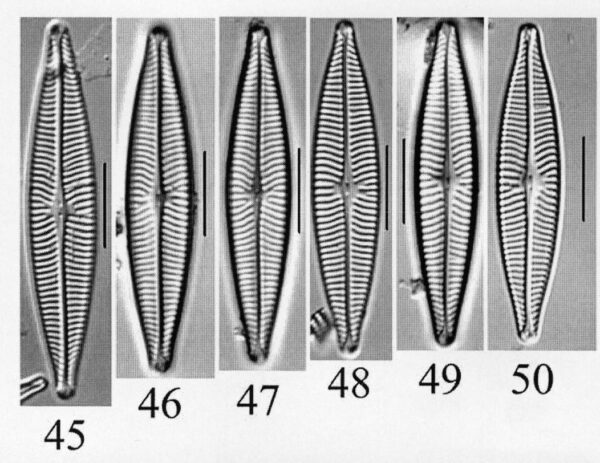 Striae radiate, becoming strongly convergent toward the ends, 12 –14 in 10 μm, lineolae 32 – 36 in 10 μm, barely visible in LM. For measurements, n = 22 valves. 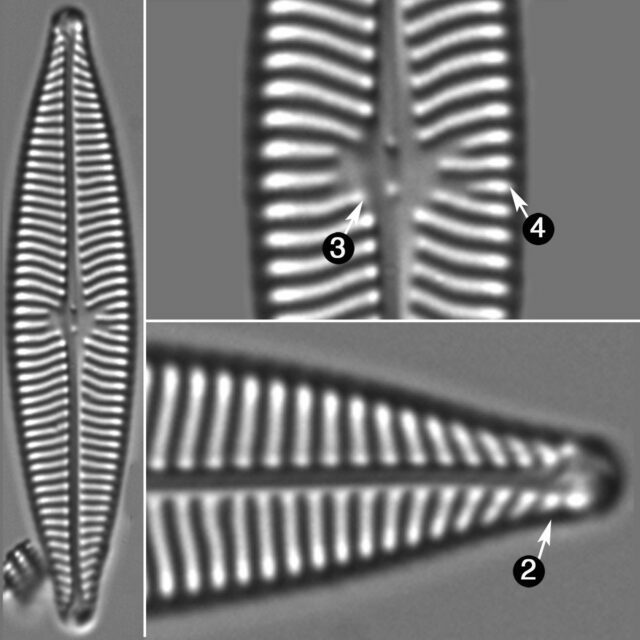 Navicula schweigeri has lanceolate valves that measure 39-49 μm long by 7.5-8.6 μm wide. Apices are short and rostrate. The central area is small, lanceolate and bordered by irregularly shortened striae.